The April release of Creative License: The Law and Culture of Digital Sampling marked the collaborative effort between the book’s authors and the team at Future of Music Coalition. Co-authored by Kembrew McLeod and FMC board member Peter DiCola, with contributions from Jenny Toomey and Kristin Thomson of FMC, Creative License is a significant contribution to the debate surrounding the law of digital sampling. Peter DiCola kicked off a book tour with two stops in our hometown of Washington, D.C. FMC, Words Beats and Life and Duke University Press hosted a panel discussionat Busboys and Poets on April 16th, 2011. Casey-Rae Hunter, Deputy Director of FMC, along with members of the DC hip-hop and DJ community, Roddy Rod and DJ 2-Tone Jones, talked with DiCola about the book and their experiences with sampling. The video footage of Casey’s interview with Peter and the full panel discussion is included below. Creative License: An Interview with Peter DiCola from Future of Music Coalition on Vimeo. Creative License: A Panel Discussion from Future of Music Coalition on Vimeo. FMC’s Kristin Thompson also conducted a five part interview with the authors on the motivation for writing the book and the issues that make it such a compelling read. 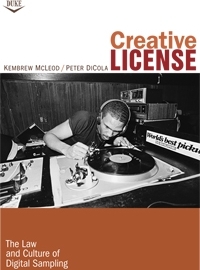 Peter and Kembrew spent over five years compiling material for the book, detailing the development of the sample license clearance process through the experiences of musicians, rightsholders, attorneys, clearance experts and historians. You can purchase Creative License: The Law and Culture of Digital Sampling at Amazon, Powell’s and Duke University Press. Submitted by readable books (not verified) on January 11, 2012 - 11:34pm.